The hunting, trading and consumption of gorillas – and other apes – is almost universally illegal in all Congo Basin countries. However, poaching continues unabated due to a lack of enforcement of national and international laws, coupled with ineffective judiciary systems. The commercial trade in bushmeat, which occurs throughout west and central Africa, is today the biggest threat to gorillas. Apes are being killed to primarily to supply high-end demand for meat in urban centers, where the consumption of ape meat is considered to be prestigious amongst the wealthy elite. Estimating numbers of gorillas poached is difficult because they are often butchered and eaten on the spot, or their meat is smoked for later sale in towns. Although gorillas may constitute only a small proportion of all animals killed for the bushmeat trade, they present easy targets for hunters, and in many areas gorillas are favoured by hunters because of the weight of saleable meat. Gorillas’ low reproductive rates means that even low levels of hunting can cause a population decline, which could take many generations to be reversed. 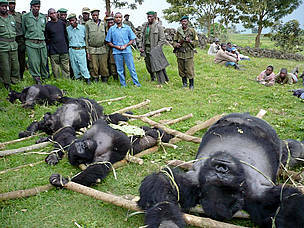 Gorillas are also frequently maimed or killed by traps and snares intended for other forest animals such as antelopes. Gorillas are also sought after as pets or trophies and for their body parts, which are used in medicine and as magical charms. Forests are rapidly being destroyed by commercial logging interests, for subsistence agriculture and road building activities. This makes it harder for gorillas to sustain their lives. 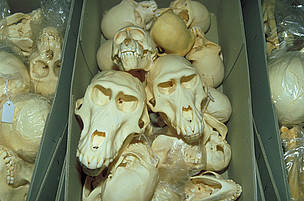 There is also a strong link between habitat loss and the bushmeat trade. As previously inaccessible forests are opened up by timber companies, commercial hunters gain access to areas where gorilla roam and often use logging vehicles to transport bushmeat to far away markets, as well as sell meat to employees of the logging companies. Since the early 1990s, outbreaks of Ebola hemorrhagic fever have caused large-scale die-offs of great apes. The 1994 outbreak in Minkébé (northern Gabon) wiped out the entire population of what used to be the second largest protected population of gorillas and chimpanzees in the world. Between 2002 and 2003 the virus claimed many human lives in the north of the Republic of Congo and at two study sites in and around Odzala National Park, 95 percent of the 600 identified gorillas died likely as a result of Ebola. There seems to be a pattern in the way the outbreaks have occurred across the region, making it likely that they were not isolated events but part of a wave that may still be spreading across the region. 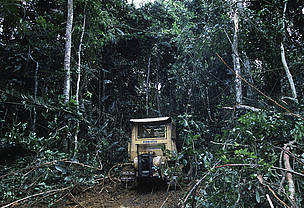 A bulldozer clears trees and vegetation to build a road into logging concession areas. Gabon, Central Africa. 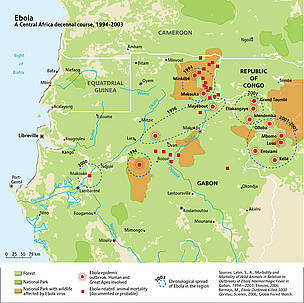 The spread of ebola across Central Africa, 1994-2003. Ebola epidemic outbreaks across the Congo Basin are a significant threat to gorillas, and also impact the few re- maining populations less exposed to poaching and habitat loss. © UNEP/GRID-Arendal. Sources: Lahm, S., A., Morbidity and Mortality of Wild Animals in Relation to Outbreaks of Ebola Haemorrhagic Fever in Gabon, 1994—2003, Elsevier, 2006; Bermejo, M., Ebola Outbreak Killed 5000 Gorillas, Science, 2006; Global Forest Watch. Visit the gorillas! Money earned through gorilla tourism contributes significantly to the conservation of the species – providing funds for conservation projects and creating jobs and bringing other benefits to local communities living near gorillas. To visit the gorillas of Dzanga-Sangha in Central African Republic, contact: info@dzanga-sangha.org. Give a gift! Buy a "Gorilla's Paradise" WWF gift and help support the Gamba Complex of protected areas in Gabon – home to western lowland gorillas as well as hippos, elephants and much more. Buy sustainable wood. By purchasing FSC-certified forest products, consumers, retailers, traders, and manufacturers help protect gorilla habitat by encouraging sustainable forestry and limiting illegal logging. Without the FSC label, your timber may well stem from illegal or controversial sources in central Africa. Donate to WWF to help support our great ape conservation work.